AdWords can be your best friend or your worst enemy. To that end, reading books on Google AdWords is a good way to educate yourself. First, select a book from this list of books on online advertising. Second, read the book. 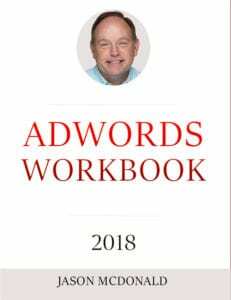 Third, try to implement its recommendations.As part of our own best-selling AdWords book, the AdWords Workbook, we maintain a list of recommended books on Google AdWords. The best way to proceed down the list is to read a book, implement what you buy in terms of the author’s perspective, test that, and then go to the next book on the list. Happy advertising! – Perry Marshall and Mike Rhodes bring us one of the true Bibles on Google AdWords. Finally, there’s a new, updated version (the 5th edition) of this class book. Highly recommended! – With a strong focus on YouTube and a quirky narration style, this is a fun, informative and a bit chatty book about AdWords. That said, it covers the basics and is written in such a way that you don’t fall asleep. Ok, before you buy all the AdWords books. Step back for a moment, and think about the big picture. Have you considered alternatives like SEO or social media marketing? What about advertising on Facebook, Twitter, or LinkedIn. These books on AdWords are fantastic, but many of them don’t encourage you to look at your alternatives. Finally, if you’d like to suggest a AdWords book for my 2017 list of the best AdWords books, please just email me your suggestion with a link to Amazon. Thanks!